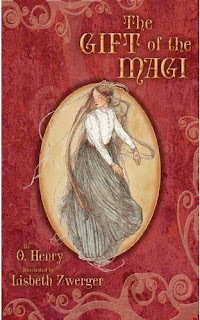 One of the first books I pull out during the holiday season is The Gift of the Magi by O. Henry. As a quick refresher, it's the brief look at a husband and wife who go to great lengths to get the other a Christmas gift. If you're traumatized by which version of this masterpiece to snag, might I suggest the one you see above with awesome illustrations by Lisbeth Zwerger. It will be another ornament with which to decorate your home. Or book tree. P.S. A great gift for that book lover you love. I'm late to the Straight No Chaser game. My lovely coworker, Panda, sat me down in front of the YouTubers last week and in no time I was reveling in the a cappella goodness. They have a great new album, Christmas Cheers to get you in the mood for any and every holiday. Visit their website to hear my favorites - Christmas Can Can and the must-hear-to-believe Flo Rida Medley. But, of course, no version of the 12 Days of Christmas can beat the video above. None. I'm a YouTube/Viral Media junkie and loved Straight No Chaser! I'll have to be sure to share.